In addition to building RepairShopr and RepairTech, Troy and Ian ran their own computer repair businesses in the past. 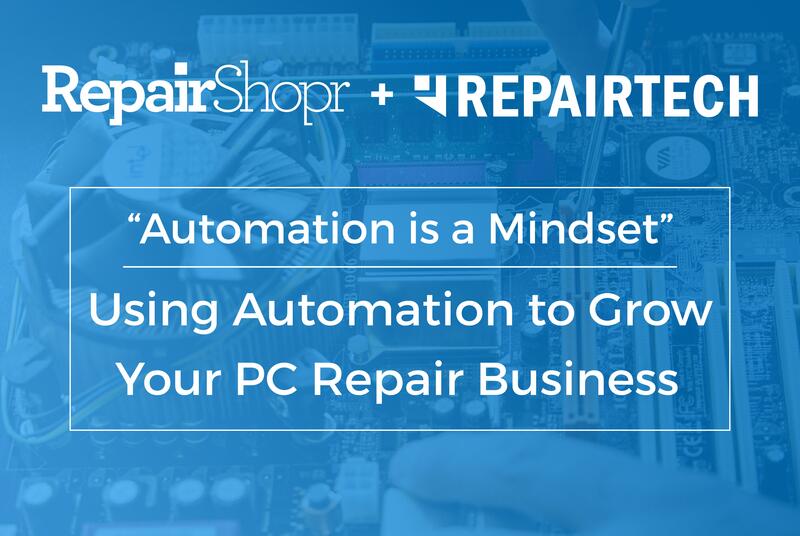 Their advice and best practices on how to adopt a "mindset of automation" are influenced by their own experiences as well as the experiences of the repair business and MSP experts they've worked with over the years. We're sharing the webinar below, along with our top 5 tips on tasks you can automate in order to free up time to focus on growing your business instead of just operating it. Generate repeat business with automated email follow ups Business is about building relationships and trust with customers so you’re their go-to resource when they need help. Unfortunately, when you’re busy servicing active customers and open tickets, it can be easy to prioritize marketing to past customers. Luckily, automation can solve that. With RepairShopr’s Marketr module, you can setup an automated 2-week follow up email with ONE CLICK. Seriously, one. This will send an email to customers two weeks after you close their tickets. You can customize the message or use our canned one. Great way to say thank you and stay top of mind for the next time they need a repair. Get started: Head to the Marketr module in your RepairShopr account and click “Enable” under the 14-day campaign. Put revenue on autopilot with Recurring Invoicing For businesses with recurring revenue, like MSPs, automating those invoices is a great option. You can automate recurring invoices in RepairShopr while maintaining control of details like frequency, period (ie. in arrears) and delivery method (ie. directly charge credit card on file). Get started:learn how to setup recurring invoicing in RepairShopr by reading this step-by-step guide . Automate day-to-day tasks when you can, like computer diagnostics tests If you’re still manually running diagnostics tests on a customer’s computer, you’re using time that could be invested in other tasks. RepairTech’s TechSuite runs all of the tests and diagnostics for you and delivers the results in an easy-to-use dashboard. That automation alone can save a computer repair business hours of work each day. Re-invest your time into getting more customers or thinking about ways to grow your business instead of running repetitive tests. Start here: We recommend checking out TechSuite’s 14-day free trial to see the power of this automation. We first integrated with Zapier last June because of the sheer power of this integration hub. Zapier lets you set up triggers that jumpstart actions. For example, you can integrate Zaps that say “when a new ticket is created, create a Customer in RepairShopr.” For inspiration, take a look at the top 5 RepairShopr “Zaps” below. But We use Zapier a ton with RepairShopr, but it’s automation power extends far beyond that. Zapier can seriously help automate so many aspects of your business, the options are practically endless. Create a free account here to start exploring.